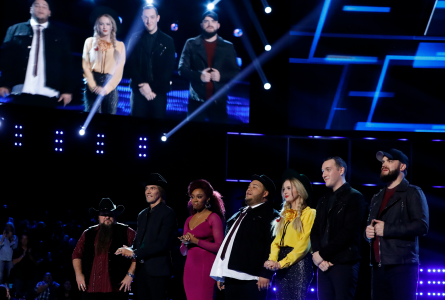 Tonight, Country super-star Garth Brooks joined NBC’s “The Voice” to help and awe-inspire the remaining Top 12 contestants. Garth Brooks has 138 million albums sold and his ultimate 10 disc collection is newly released. “The Voice is the true test of sincerity,” Garth said. He also said what he loves about “The Voice” is that everyone can achieve their dream. 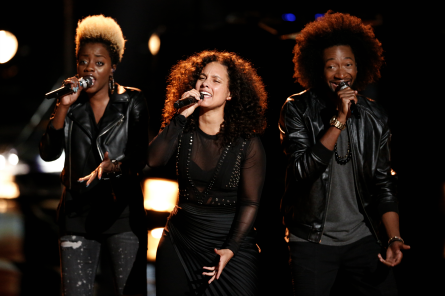 Alicia Keys reminded viewers that there are NO more steals, no more saves and “the stakes are really high,” she said. Sundance sang “My Church”. Blake said Sundance is taking female song that’s popular right now and making it his own. Garth said the more he strips it away, the more Sundance can make it his own and create magic. Sundance said he wants to take everyone to church. Blake said he can’t express enough how important that performance was in giving her “full voice” and her voice is “so powerful.” He also said there’s a lot of passion in her voice. Coach Miley said Darby represents the song well. Alicia saved Sa’Rayah last week after the Knockout Round. Sa’Rayah sang Jon Bon Jovi’s “Living on a Prayer” she said which is different for her but it’s like her life right now. Garth said being a female, she can take the song to a new level. Previous coach Miley said she loves to see Sa’Rayah do more rock songs and it’s what she had Sa’Rayah do in the beginning. Blake said his favorite thing about her performance is sometimes she his notes where it looks like she’s even surprised. Coach Alicia said she continues to be wowed by her, and very proud of her. Garth knew about Billy being a child star. Billy chose to sing “The Show Must Go On”. He said after hearing Billy, “the future now belongs to him.” Billy explained “this song captures the history I’ve had, the struggles.” Billy also said “The Show Must Go On” was his defense mechanism. Blake said “it’s amazing” and way before he had any success that he remembered Billy open one of the awards shows. He said Billy has hung onto his success because he’s a million times better as an adult. Coach Adam was almost speechless. “I just think when you hear something like this happen on stage,” what could possible epitomizes the show more. Adam said Billy is truly special and it’s only the beginning for him. We’ said Alicia is helping her achieve her dream. Garth was stunned at We’s voice and couldn’t believe it was the same person. We’ chose to sing “Take Me To Church”. Alicia said with this song We’ will be able to show people why she’s such a special artist. Miley said she gets emotional every time she sees We’ perform with people in the audience grabbing her and it’s amazing to have all those people “loving on her.” Coach Alicia called We’ “the real deal and “unforgettable.” She also said she’s proud of We’. Adam said Aaron’s voice is so special that he has a responsibility to be a singer, otherwise it would be a dis-service to the world. It’s so special and distinctive. Blake said if Godzilla could sing, that’s what he’d sound like. “The fire comes out!” Blake also pointed-put that Aaron is breaking new ground because they’ve never had anyone on the show like him before. 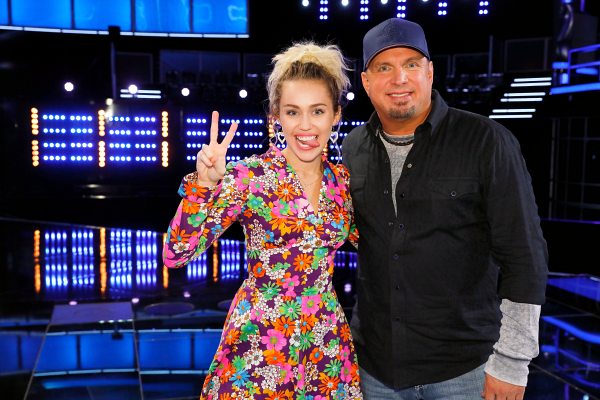 Coach Miley said they were going back and forth with the song and how to do it. He said she could see Aaron being an artist like the original artist and called him special. 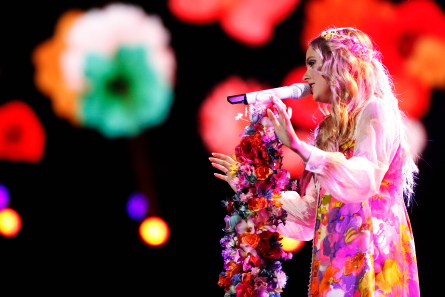 Alicia called it a beautiful song and powerful and Courtney gave an unforgettable feeling to the audience. Coach Blake said they all feel “just a little bit more invested in the artist that they save moving forward. He said he made the right choice and she’s having the moment that she earned. 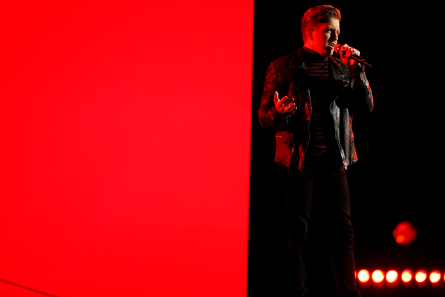 Josh was left winded and emotional after his performance. Blake, who had Josh on his team before Adam stole him, said “getting to this, you never know if you made the right or wrong choice as a coach. You do deserve to still be here.” Coach Adam said “no one works harder than Josh, and stated that he was really lucky to have Garth helping since this isn’t his wheelhouse. He told Josh he’s very proud to have him on his team. “a cosmic coincidence” and thanked Ali for trusting to her. Miley reminded Ali that they’re in it to win this! 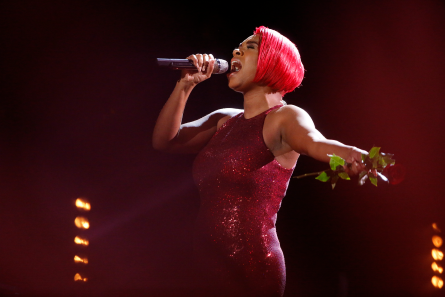 After host Carson Daly introduced the coaches and announced that Alicia Keys will be performaning a new song on “The Voice” stage, the Top 12 artists were then brought out onto the stage. 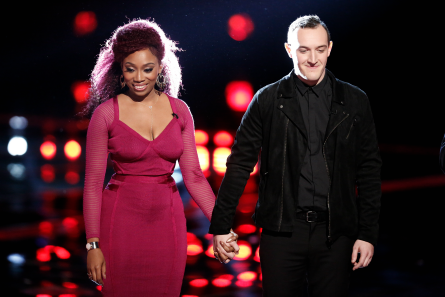 Daly asked We’ about selecting Team Alicia after her 4-chair-turn in her Blind Audition. We’ answered, “I felt like she had something in my heart that I vibed with and said they’ve grown a greater connection since then. 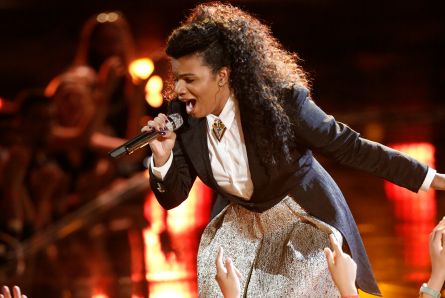 Then Daly announced the first artist save was from Team Miley – Ali Caldwell! The second artist saved was Team Alicia’s We’ McDonald. 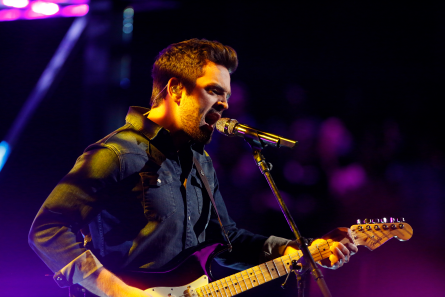 The next artist America saved was Team Adam’s Brendan Fletcher. 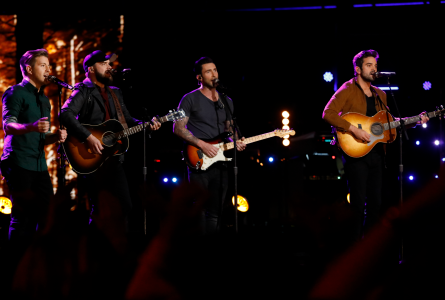 Adam Levine performed politically charged 1966 famous protest song “For What it’s Worth” by Buffalo Springfield with his artists Billy Gilman, Brendan Fletcher, and Josh Gallagher. When Josh Gallagher was asked what he has gained by being on Team Adam, he answered that Adam has opened his eyes to a lot of different styles that he didn’t know he could “hone in one” and thanked him. Then Daly announced Courtney Harrell from Team Blake as the next artist saved, followed by Billy Gilman from Team Adam. Coach Alicia Keys hit the stage to change her tune to “Holy War” after stating it’s the only song she can sing given the current events. She was originally going to sing her new song called “Blended Family.” She posted a poll earlier on Twitter asking fans which song they’d prefer to hear on the live show tonight. Sundance Head said coach Blake is a wonderful guy and hoped he had the opportunity to touch everyone there. The next save was Darby Walker from Team Miley. 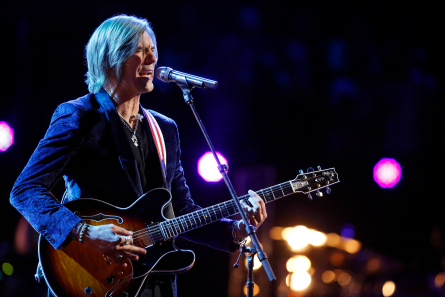 Then, from Team Blake, Austin Allsup was saved. Miley performed godmother Dolly Parton’s “There’ll Always Be Music” with her team’s artists’ Aaron Gibson, Darby Walker and Ali Caldwell. Carson Dally announced from Team Alicia, Christian Cuevas as the next one saved. The next artist saved was Josh Gallagher fro Team Adam making his team completely safe! 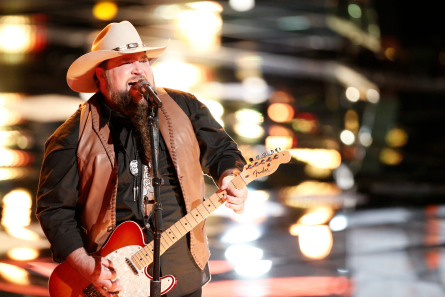 America also saved Sundance Head from Team Blake. 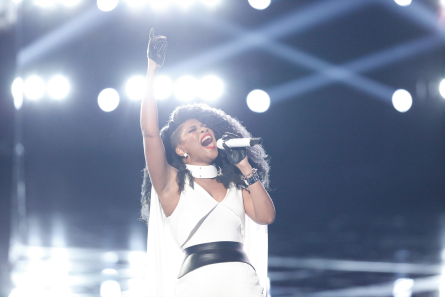 The remaining two artists Aaron Gibson and Sa’Rayah were left to depend on the Twitter Instant Save vote to see who’d be moving-on to next week’s last show. The each gave their best performance in an effort to sway the votes for themselves. Sa’Rayah sang “Rock Steady”. Aaron sang Ed Sheeran’s “Lego House” for his Save Song. Alicia Keys told Sa’Rayah after her performance of “Rock Steady” there’s no denying the power and beauty of your voice.” She added, “if you have a heart in your chest, you hear and feel Sa’Rayah.” Miley told Aaron that “no matter how it turns out tonight” she can’t wait to see what they do together in the future. She then urged all of her fans to vote for Aaron. Sa’Rayah’s parting words to Alicia was “thank you for believing in me and thank you for your love.” Aaron spoke to his coach Miley that he feels the love every time she’s in the room and thanked her for teaching him to be himself. Alicia called Sa’ Rayah “phenomenal.” Miley told Aaron thank you for performing from an artist part and not a competitor. The Instant Save Vote went to Aaron Gibson. Edits Not Seen on CELEBRITY FAMILY FEUD Season 4 Sneak-Peek!